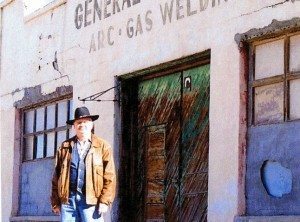 The unexpected death of Kell Robertson on November 7, 2011, featured poet in last Spring’s Malpais Review and one of the state’s best poets, was a blow to the poetry community in New Mexico, and beyond the state too. Another of our elder poets is gone! As one who attended Kell’s burial, I can say it was an appropriate ritual, with a small group of friends, his daughter Penelope from San Francisco, poet Kendall McCook, Kell’s best friend of many years, and of course, Argos MacCallum, on whose land Kell lived, local poet Bill Nevins, and Kell’s musician friend Mike Goode of Ohio, who provided music. The hole in the ground had already been dug when we arrived out on the high desert land on Highway 14 near Santa Fe. This was Argos’ land, which he had purchased from the Synergia Ranch Commune, of which he was a former member. (The commune, founded in the 1960s, still exists). There was no casket, no embalming, all just natural. Kell lay on the ground on an Indian blanket, two ropes underneath for later use. He was lying on his back, hands on his chest, dressed in his western clothes, including boots and cowboy hat. I believe this was just as Kell would have wanted it. Just above the head of his grave was a good-sized cholla cactus. Words were said, poems were read (by Argos, Kendall, Bill, myself). Mike played his guitar, ending with “Amazing Grace,” which we all sang together. Then, one by one, we all went up to Kell, said our last words, some putting flowers in his hands or some sort of remembrance. A symbolic whiskey libation was poured onto the ground, into the grave, then the bottle was finished off by those in attendance. It was a chilly day with pale sun and a slight breeze. The cacti, prickly as Kell, stood guard during the ritual, cholla, ocotillo, a prickly pear, a barrel cactus. Then Kell’s body was wrapped up in the Indian blanket and the ropes used to pick him up and place him in the ground, after which we took turns shoveling the pile of dirt. An incredible stone, tall, thin, dark-colored and looking as if it had been sculpted, about three and a half feet high, was placed at the grave’s head, near the cholla. The gravesite wasn’t far from the little house Argos had made for him 15 years earlier, likely saving Kell from the streets or something worse. It was Argos who took care of Kell, did what had to be done, put up with the old pícaro – not an easy task. I am very happy we were able to have Kell as the featured poet in Spring 2011. Kell was pleased too. All of his books are out of print now, so that issue of Malpais Review is the only current publication of his work (plus one poem in the subsequent issue). I hope that in the future a book of Kell’s collected poems is published so his work is not lost. Kell may have been a hellion of the barstool when drunk but he was also a hell of a poet, a champion of the underdog, up from poverty, survivor of a tough life. A friend of the old Wobbly folk singer Utah Phillips, he said Hank Williams and Woody Guthrie were his chosen “fathers.” Pretty Boy Floyd was a hero. Although he was buried with his old cowboy hat, I can still see it, in my mind’s eye, on the belly of his grave as if it were a pet dog guarding his spirit. And I hear his voice, and all the winds in the world can’t blow them away.